Growing up, whenever my family celebrated a special occasion or holiday, we would head out to enjoy Bò 7 Món – 7 courses of beef. This may seem strange as Vietnamese cuisine isn’t really known for heavy amounts of beef but maybe that’s why this specialty is often saved for momentous occasions. These days you can find many restaurants that offer Bò 7 Món, but in my family’s opinion, no one does it better than Pagolac Restaurant in Westminster, California. My family has been coming to Pagolac Restaurant for over 20 years. Most of the dishes you order, you cook yourself on table top grills or mini boiling pots of vinegar water. All proteins are meant to be wrapped in the rice paper sheets with assorted veggies then dipped in a very pungent and savory sauce called mắm nêm. And although there are a standard set of items when eating Bò 7 Món, my family typically orders à la carte as there are some of the dishes that just aren’t our fav. We always order the thinly sliced beef, shrimp, squid, meatballs with shrimp crackers—and my personal favorite, Thịt Bò Nướng Lá Lốt or Grilled Beef Wrapped in Betel Leaves. I would always plead for my mom to order extra plates of it as the dish was amazing to me. Just the right mixture of spices in the beef and all enveloped in the fragrant betel leaves that tasted even better slightly charred from the grill. Once wrapped and grilled up, Thịt Bò Nướng Lá Lốt can be enjoyed a number of ways…..with rice or vermicelli noodles and even as a đồ ăn nhậu (beer food). But my favorite is to wrap some in Rice Paper Sheets (bánh tráng) and throw in a few veggies such as the pickled cucumbers or carrots. Delicious balance in texture and taste! Truth be told, I can’t recall a time when Mom made Thịt Bò Nướng Lá Lốt at home but that doesn’t stop me from associating them with her. Because when I think about this dish, it makes me reflect on happy, celebratory times and images of Mom come flooding back to me as she stood over the table top grills at Pagolac Restaurant laughing and distributing all the sizzling items to our plates. Scallion Oil (hành mơ): In a sauté pan, slowly heat ¼ cup of canola oil. Add ½ cup chopped scallions. Cook the scallions on very low heat until they are wilted but still bright green. Approximately 2-3 minutes. Pull from heat and set aside. Pickled Carrots and Cucumbers: Cut carrots and cucumbers into small matchsticks and place in a small bowl. Cover them with Rice Wine Vinegar and a pinch of Sugar. Dipping Sauce (nước chấm): Combine ½ Cup Fish Sauce (nước mắm), ½ Cup Sugar, ½ Cup Fresh Lime Juice, ¼ Cup Warm Water and stir until sugar is dissolved. Add 1 Teaspoon Chili Paste. Adjust amounts to desired to taste. 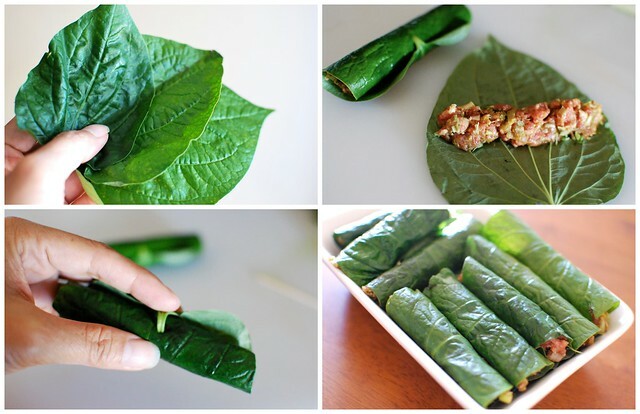 To assemble the rolls, take one betel leaf and place it shiny side down. Scoop out about ¾ tablespoon of the beef mixture and shape it towards the center of the leaf in a row. Slowly and tightly roll the leaf from tip to base. Once you get to the base, use a toothpick to prick a hole in the center of the roll and tuck the stem of the betel leaf in the hole to secure it. (Alternatively, you can use soaked toothpicks or skewers to hold the rolls together). Cover a baking sheet with foil and brush it with the scallion oil (hành mơ). Place the rolls, seam side down, on the sheet and brush them with additional scallion oil (hành mơ). If cooking with an oven: Turn broiler on high and place baking rack directly underneath it. Transfer baking sheet with rolls to the oven. Broil for 6-8 minutes, turning the rolls every 1½ minute to cook evenly and prevent burning. If cooking on a grill: Place rolls in a wire mesh grilling basket. Grill rolls on each side for 1 minute. 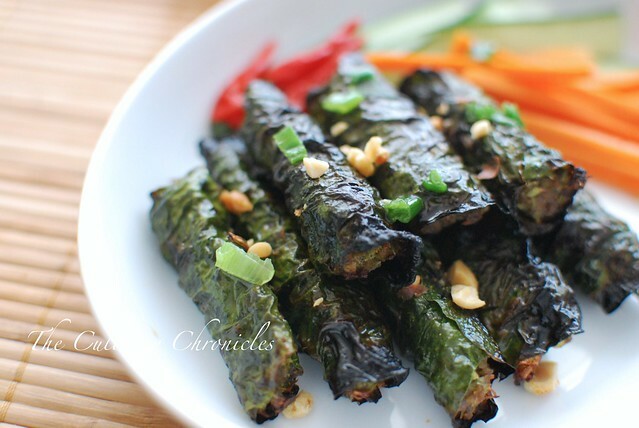 Transfer rolls to a plate and brush with scallion oil (hành mơ) and sprinkle with crushed peanuts. 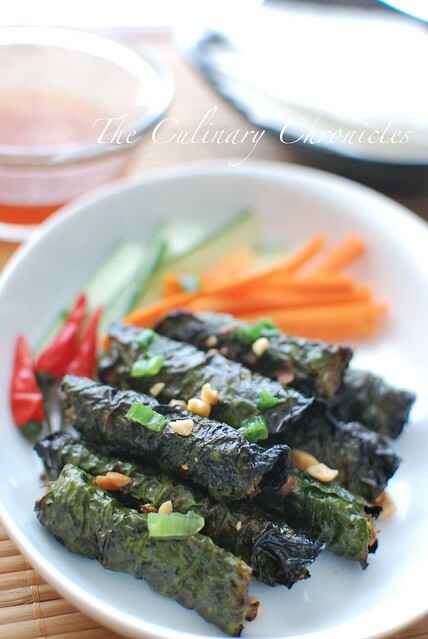 Serve with nước chấm, pickled vegetables and moistened rice paper sheets. Previous Post Celebrating our Blogoversary with Uni (Sea Urchin) Pasta! Next Post Please Excuse the Silence…. HOLY crap, this looks like a dream come true. Im not a big fan of beef, but I do love Bo la lot! Yum yum! Wow this looks so good. I’ve never seen these leaves in the UK though, even in the Chinese supermarket, do you think vine leaves would work as well? Hi Allie! Sometimes you can find them in frozen but if you still can’t get your hands on them, grape leaves would be ok, too. Cheers! That looks delicious. 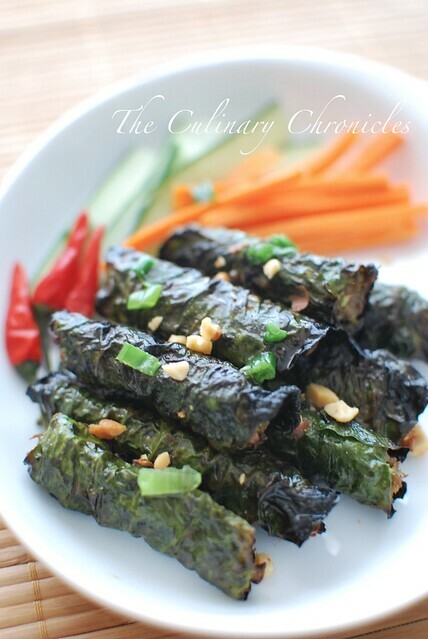 Betel leafs are very commonly eaten in India as well but I have never heard of a cuisine made with it. I just have to give these a try. 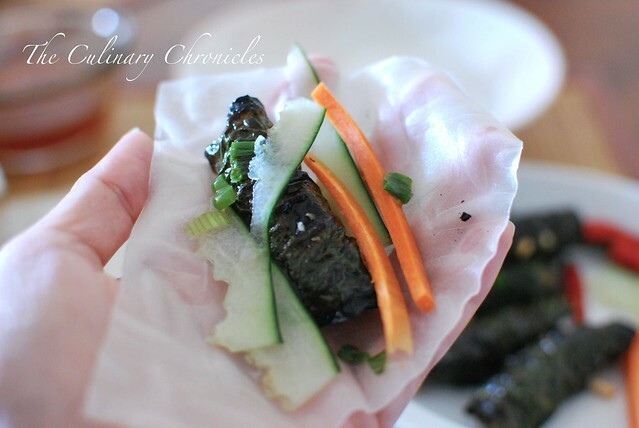 Vietnamese restaurants around here serve these made with grape leaves. I never knew how to make the filling, though. I will definitely try these! Oh you’re making me HUNGRY. This is my favorite Vietnamese dish of all time. All the VN restaurants in the East Bay do bo la lot with grape leaves — still tasty but not the SAME as the actual la lot leaf. 😦 I’ve been trying desperately to find seeds or something but no such luck 😦 Till then, I will just drool at your pictures. Heya i am for the primary time here. I found this board and I in finding It truly useful & it helped me out much. I’m hoping to offer one thing again and aid others such as you helped me.